A short post tonight because I have got to start my book for my mystery book group meeting on Tuesday. I think I told you I’m leading the discussion. Maybe I should just bring some yummy dessert and they’ll forget I’m supposed to lead the discussion. Ha. My wonderful friend Christine recently told me about Her Royal Majesty. Have you guys read this publication? I hadn’t heard about this before so I’m looking forward to checking out some of the articles. 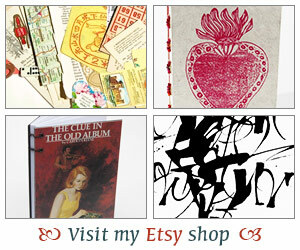 I know a lot of you collect bookmarks and I’ve found these funky bookmarks on Etsy. I especially love the Zombie Hands and the Witches’ Shoes. Aren’t they great? Late last year Faber & Faber released these beautiful poetry books. I’d love to add these to my poetry shelf. Finally, who doesn’t love a video about books? You must check out these two videos The Page Turner and The Joy of Books. Seriously, I could watch these over and over again. Hope you have a great weekend and wish me luck and finishing my book. Love the zombie hands bookmark! Thanks for the links, Iliana! When I win the lottery, I’ll buy a gift certificate, so you can buy some Faber books. Hopefully you also have a long weekend and will have lots of reading time–I’m hoping to finish a book or two myself! I’d seen the Joy of Books video, but not the Page Turner – which was amazing and made me smile. Thanks for the link! Oh I love love love that joy of books video!! Hope you’re having a great weekend! Those Faber poetry books are lovely! Those bookmarks are too cute. I still need to check out the video. Thanks for sharing all of the links. I especially enjoyed the two videos!